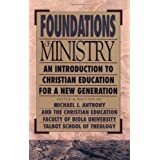 Foundations of Ministry: An Introduction to Christian Education for a New Generation (BridgePoint Books) ReviewThis is a non-fiction how-to book on Christian Education. It's probably not going to be a classic, but it is very good book if you are interested in thinking about all different needs and different spheres of education -- that is curriculum, environment, and so on. The book has 25 chapters, each given to one special theme. Some of the chapters address psychology, special education, home schooling, Christian schools, mission education, Christian education in the church and in the home, and some other topics. Want to learn more information about Foundations of Ministry: An Introduction to Christian Education for a New Generation (BridgePoint Books)?